The Killzone card game is not official. A fan made it, and now you can play it. The game was created by a person who goes by the name pineapple1. He/she writes to Kotaku that "I'm a big Killzone fan. And I also was a big fan of Eye of Judgment. After Sony pulled the plug on the game's online, I turned back to my old idea of creating a card game based on Killzone. After quiet some time I completed it." 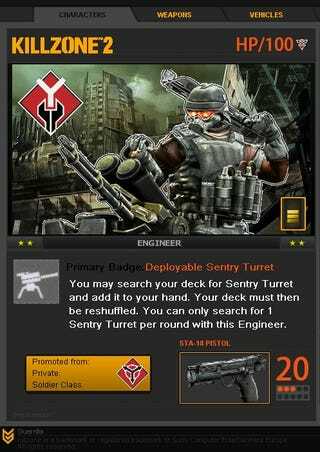 You can download rules and a deck for either side, Helghast or IGA. Be warned that the downloads are hosted on Mediafire, so expect some pop-up action.